[HollywoodInvestigator.com] It's rare that a micro-budget film spawns a popular micro-budget franchise. Without a pickup deal from a big studio -- Paramount nurtured the $15,000 Paranormal Activity into $5 million sequels -- a micro-film's franchise is likely to remain obscure. If you can't sell out, you stay small. The comedy duo of Caesar & Otto defy those odds. The films' budgets have remained micro. Caesar & Otto (2007) cost $3,000, whereas Caesar & Otto's Paranormal Halloween (the 4th installment) is still under $10,000. Yet the franchise's cult following has grown, thanks to the convention and film festival circuits. The franchise is also attracting name actors. Not the most famous names, but not unknown either. 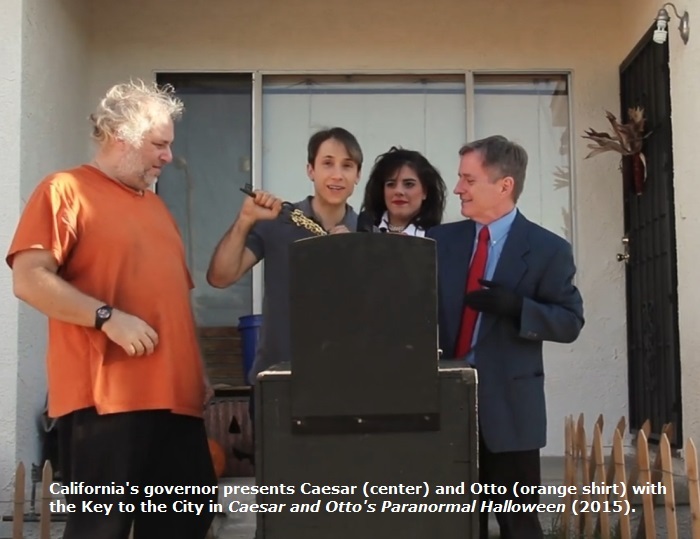 In Paranormal Halloween the brothers (yes, Caesar & Otto are brothers) are hired by California's governor as caretakers for his summer mansion. This, after the brothers' father inadvertently kills an escaped mental patient/serial killer, for which the governor presents the brothers with a key to the city, only to discover that the heroes are homeless, and thus have no front door to put the key into. Why would a state governor present anyone with a key to a city? Why wasn't dad honored? And why is the governor's office in Los Angeles's City Hall rather than in Sacramento? It's the sort of contrived lunacy common to what were once known as screwball comedies. "Back in the 1940s, movies like Abbott & Costello Meet Frankenstein were big hits, but studios stopped producing movies like that," Dave Campfield, who also writes and directs the franchise, said to the Hollywood Investigator. "To stand out, a micro-budget filmmaker has to offer what the industry currently isn't. Our first installment, Caesar & Otto, was a spoof of sitcoms. No horror. I could see it wasn't going anywhere. The thought then occurred to me that a comedy-horror crossover might be a unique angle. I love comedy-horror, and it allowed me to reach out to that wonderful and passionate base of horror fans." Campfield plays Caesar and Paul Chomicki is brother Otto (above). They are an unconventional comedy duo, partially because Otto looks too old to be Caesar's brother. "Like Steve Martin and others, Paul went gray at a young age," says Campfield. "We’re actually just three years apart. We'd met in high school, were both sort of outcasts, and became great friends. We both loved movies and acting, and often did sketch comedy together in the form of home movies. Caesar and Otto were an outgrowth of those sketches. The two characters together gelled to me." So after the governor hires them as caretakers, the brothers and their dad (making it a trio) arrive at the mansion to find an eccentric staff (so why were they needed as caretakers?) and odd neighbors (models-turned-medical students). Then the hauntings and manifestations and poltergeist activities begin -- all of them spoofs of past horror films. Think of Paranormal Halloween as a poor man's Scary Movie. 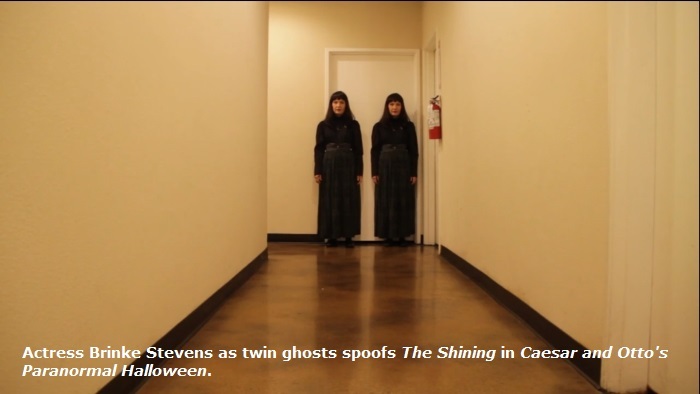 Some of Paranormal Halloween's satirical targets are recent, but many are vintage -- Halloween, The Shining (above), Poltergeist, ZZ Top, Pink Floyd, etc. Hollywood targets its horror to teens and 20s. Is Campfield not worried that younger viewers might miss the gags? "No doubt if this movie was backed by Hollywood, I couldn't have gotten away with that," says Campfield. "But that’s the advantage of not having studio money. You can do what your heart tells you. I'm a child of the 1980s. These were the films I grew up with. At the same time, movies like The Shining and Halloween will remain for all ages. And for those who don’t get the references, hopefully the comedy won't be solely dependent on knowing the source material." Although Paranormal Halloween did without Big Studio money, it is the first of the Caesar & Otto franchise to secure financing from the newly revitalized Carolco Pictures. Many of the film's stars also enjoy producer credits. Did any of these actor-producers help fund the film? "Most of the budget was raised through our indiegogo campaign," says Campfield. "Plenty of our producers were not involved fiscally but helped in other ways, such as securing locations and such. Producer/production designer, FX artist/second unit director Richard G. Calderon turned his house into production headquarters. Many of the sets were built in his garage." Producer Daniel Sullivan's home and print shop were also used for locations. Paranormal Halloween was shot in and around Los Angeles. The film is noteworthy for its cast's many B-list names (e.g., Tiffany Shepis, Vernon Wells, Brinke Stevens, Felissa Rose, Debbie Rochon, et al.) "That’s largely due to Felissa's work as producer," says Campfield. "We're great friends from way back. I made my debut feature, Dark Chamber, with her -- and every feature since. All of the above names came through her. She convinced them to work for well below their rate because of her belief in me. I can't thank her enough." For better or worse, Campfield is a true auteur. The buck stops with him. He writes, directs, stars, edits, and can be considered the lead producer. Does he look to anyone for a second opinion to check his instincts? Is it challenging to wear so many hats? "It is," Campfield acknowledges. "Emotionally, I don’t think I'm cut out to be a director. It's too taxing to take on in addition to writing, acting, and producing. At the same time, I know what I'm looking for -- and on this budget it's more convenient to direct. One less person to pay. One less person to deal with. There are times that the actor behind me makes a choice I'm not happy with, which I remain unaware of until I'm editing -- one of the many compromises you deal with when there's no time for playback on set, there being so few shooting days. I often show my girlfriend/co-star, Josephine Iannece, the scenes as I edit. If something's not clear to her, I adjust it. "I spent one year at the College of Santa Fe as a film major before taking Steven Soderbergh's advice. 'Every college student who wants to be a filmmaker, drop out and make your own feature. You’re going to be judged on what you produce, not your degree.' Dark Chamber was my film school. "Acting wise, I can't say I have a formal education. I passed my audition for the Actors Studio but chickened out and never went back. I believe in trial and error as an actor. Some people loved what I did as Caesar in Caesar & Otto’s Summer Camp Massacre and Caesar & Otto’s Deadly Xmas. Some people hated me. With Paranormal Halloween, I tried to keep the character more grounded and less cartoony while keeping the slapstick alive." The Caesar & Otto franchise has improved. 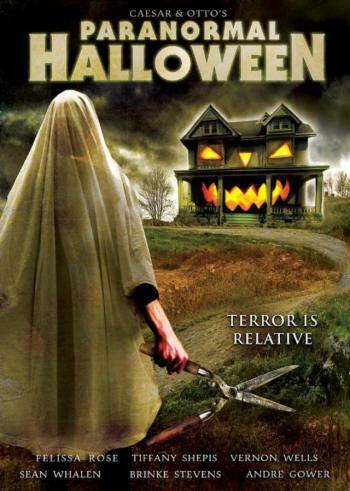 I was bored with Summer Camp Massacre, so much so that I dreaded seeing Paranormal Halloween. But I was pleasantly surprised. The production values are slicker, the comedy funnier, and I wasn't bored. Others feel likewise. Ambush Bug of Ain't It Cool News writes of the franchise, "each time the quality of the filmmaking and the humor leaps forward in quality quite a bit. 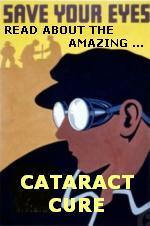 The latest, Caesar & Otto's Paranormal Halloween does so substantially." It's nice when filmmakers strive to improve their craft. 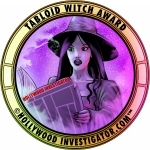 Dave Campfield shares company with indie regional filmmakers such as Steve Hudgins and Matt Farley, whose submissions to the Hollywood Investigator have similarly improved over time. Caesar & Otto's Paranormal Halloween was shot on a Canon 7D and edited on Final Cut 7 "while experiencing more system crashes than I care to remember."